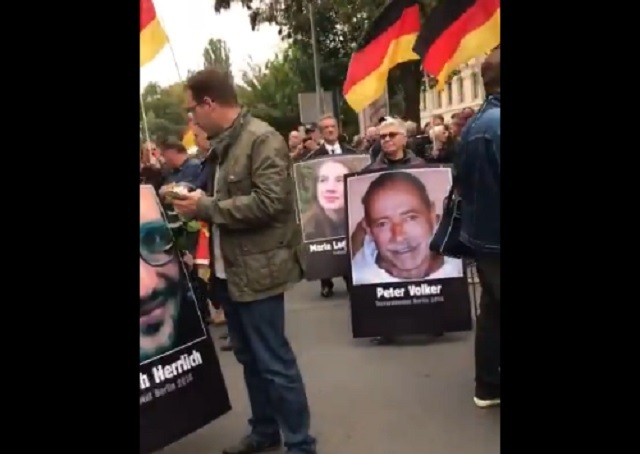 Video from Chemnitz, Germany shows right-wing demonstrators marching through the streets holding large portraits of the victims of killer refugees. Thousands of protesters staged a ‘mourning march’ in Chemnitz for people believed to have been killed by migrants, following the fatal stabbing of Daniel Hillig. 23-year-old Alaa S., from Syria, and 22-year-old Yousif A., from Iraq, were arrested following Mr Hillig’s death. Revelations that the Iraqi suspect had a string of convictions for crimes including fraud, drug dealings, and serious bodily injury — which earned him a two-year suspended sentence — and was supposed to be deported sparked public outcry. The anti-mass migration Alternative for Germany (AfD) party and the PEGIDA movement, best known for its regular street protests against ‘Islamisation’ and mass migration, staged the “mourning march” in response. Participants carried placards bearing the names and likenesses of people believed to have been killed by migrants, including medical student Maria Ladenburger — the daughter of an EU official who was raped and drowned by Hussein Khavari. Khavari had allegedly raped a 12-year-old girl in his native country before coming to Europe claiming to be a ‘child refugee’. He was subsequently given a ten-year sentence for throwing a woman off a cliff in Greece, but spent only a very short time behind bars before being paroled — and promptly moved on to Germany, where he killed Miss Ladenburger. Khavari's father said in December 2017 that his son was born in 1984 and was 33-years-old. Viral video from the event shows patriotic Germans explaining to a brain-dead reporter why they're sick of Merkel's open borders. Despite massive censorship by Big Tech and the fake news media, people are waking up to fact we were sold a bill of goods.